If you're considering journaling as a New Year's Resolution, Lynn Obermoeller shares some insights here in our last post of 2012. And for those not quite ready to let go of the holiday season, check out Lynn's story, Mistletoe, one of 12 nice (not naughty) tales in Fifty Shades of Santa. Lynn is a member of St. Louis Writers Guild and Saturday Writers. She also belongs to a critique group, WWWPs (Wild Women Wielding Pens) and talks weekly with another writer friend. You can visit her at her blog, Present Letters (http://www.lynnobermoeller.blogspot.com), on Facebook, or Twitter @Obermoeller. What is journaling and how did you get started? : For me, it’s just the act of uncensored writing – whatever you want to write. To me, journaling is like keeping a diary or like writing a letter. I don’t believe there is a right or a wrong way to journal or to write letters. I’ve always written letters from the time I could write. I got into journaling about 20 years ago when a group of friends and I met monthly to write. We decided to use Julia Cameron’s The Artist’s Way. Top priority for Cameron is “morning pages” where you write three pages (preferably in the morning) of whatever comes to mind—no editing, no interference from the inner critic. It can be pure babble (just like my letters). It’s kind of like a warm-up to better writing. Like stretching before you exercise. I want to say I got started journaling long before that, I just didn’t know it at the time. I was a sophomore in high school and flunking English. The next quarter we were assigned to journal – you could write anything you want, any length, just write something every day. I decided I could handle that. And I fell in love with it. I wrote and wrote. I wrote more than the smartest girl in the class—and that was saying something. It was calming and made me feel whole. Something I desperately needed then. I ended up with a B in English and the teacher wrote in my notebook to consider journalism as a career. I blew him off. I wasn’t a writer. That stuff was just babble. So, when my friends and I began The Artist’s Way, I loved morning pages, just like I loved writing letters. My censor is turned off when I journal or write letters. I think that’s an advantage, as I know friends who edit as they write. There are a lot of people who edit as they write, and that’s not a bad thing—it’s just not the way I journal. It explains why I was able to handle NaNoWriMo – there’s no editing involved when you’re trying to get 50,000 words written in 30 days. Has technology changed the process? Not for me. I know people who journal by using a keyboard, but for me it is not the same. I find the act of physically writing to be therapeutic, and I feel a deeper inner connection while writing by hand. Most folks groan at the idea, but I love it. I always have my equipment with me wherever I go. I tell my friends that if it weren’t for journaling, I’d be locked away. It allows me to get all the junk out. Sometimes answers to questions come through when I journal. I also write down my dreams, and that too, can be very enlightening. I heard Stephen King has gotten a lot of his story ideas from his dreams. I’m not sure if that’s a fact, but I can imagine some of my own dreams and can see how that could happen. What else would you like to add about journaling? Like letter writing, journaling can also be a way of recording history, the every day happenings of a person. I came across some letters from my mother-in-law that were from her father. There’s nothing written that’s earth shattering, but it was interesting to know what folks did back then; their way of life, how they felt. When my husband moved into our current home, he found letters from the 1800s in an old suitcase in the attic. That was the only way people communicated long distance back then. One particular letter said something like, I’ll see you in Missouri in about six months. Times have changed and even more so in the past ten years, but the written word will always be a treasure, so long as we treat it that way. Any advice you’d like to give? Journaling may seem like a waste of time—why not get to the good stuff? But I think Cameron was on to something. The Artist’s Way is still relevant today to writers/artists as it was when it first came out in 1992. Sometimes when I don’t feel like writing much in my journal, I’ll write a letter to someone instead. For me it’s a similar process, only I can keep in touch with someone at the same time… in a different kind of way… a way that’s becoming a lost art. And who knows what kind of mark it will leave on history! You may remember today's featured author, Ansha Kotyk, as one of the founders of The Writers' Lens. A busy schedule kept her from being a regular contributor, but here's a glimpse into what kept her hopping in 2012. Ansha writes upper middle grade fantasy adventure stories for kids and adults who are still kids at heart. Her novel GANGSTERLAND, about a boy, a bully, and a magical comic book, spent its first 3 weeks in the top 10 of Hot New Releases in Children's books about bullies. Available now in paperback and ebook. She will be teaching a workshop on Using WordPress at the New England Society of Children's Book Writers and Illustrators conference this May. The Writers' Lens is about "Bringing fiction into focus." What brings your writing into focus-- the characters, the stories, the love of words? My writing starts with the plot. I'm a story kind of gal. After I have the story idea, I look for my characters, the one's that will work the best and make the story better. And then the story forms as I write it. And I suppose the characters have a lot to do with that. It's always magical to me how a story can start as one thing in your mind and turn out completely different once you start writing it. What inspired your latest book? Gangsterland was inspired by my love of the 1920s, and after reading The Great Gatsby I wanted to experience the '20s for myself. Then I thought, how cool would it be to be inside a book like The Great Gatsby? I decided to find out. What do you think readers will like about your book? 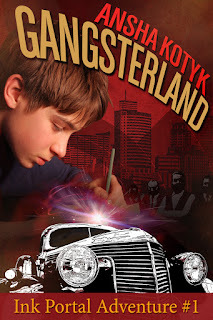 Gangsterland is a story about a boy who is learning how to grow up. He's learning to believe in himself and to trust himself in making the right decisions. I think everyone can identify with Jonathan this way. But the story of Gangsterland is also the adventure of being pulled into a comic book, meeting the characters there and finding your way out. A true adventure. Would you share a bit about your next project? I would love to! The next book in the Ink Portal Adventures is called Apocalypse Junction. Jonathan and the gang must search for Molly's little sister while playing part in a geo-cache competition. The villain pushes the kids to overcome their greatest fears to win each cache, and each clue, in order to find Margaret. The question is will he push the kids too far? How much fact is in your fiction? I enjoy research. I want to provide as much honest detail in my stories as I can so that I can give the reader an authentic experience when they read my stories. What makes your book/characters unique? I think every book and every story is as unique as the person who is writing it. Each writer comes to the page with their own life experience and their own ideas for stories. I think every writer can find readers that will believe in and love their work because of this. What are your top three reasons for writing? I write because I love stories. I love how they come together in my mind and I love to see them evolve even as I write them. Stories have a life of their own and I feel like it's my job to help them into the world. Is there a different genre or type of book you'd love to try to write? I would love to write Science Fiction. I love reading it. But I find that the stories I write are more fantastical than SF would allow. So yup, if I were to choose another genre to write it would be Science Fiction in the vein of Ray Bradbury. What's your favorite writing accessory or reference? Google. dictionary.com and my friends. I have friends that have some awesome hobbies like mountain climbing, wilderness hiking and marathon running. I love to ask them detailed questions on their experiences. The Biggest Story of the Year on The Writers' Lens! The Biggest Story of the Year on The Writers Lens! As I continue to showcase some of the stories from The Writers’ Lens’ inaugural year, I wanted to focus on the biggest event. If I added up the views from all the different articles we ran on this event, it might have made number one on the list of most viewed, but in terms of size, scope, and the information provided it can’t be beat. The Writers’ Lens partnered with St. Louis Writers Guild and the Missouri Writers Guild to interview several of the speakers at the 2012 Missouri Writers Guild Annual Conference. T.W. Fendley, David Lucas and I set up our computers, cameras, and voice recorders at the conference and had an amazing time getting to know the interviewees. We had a number of setbacks, snafus, technical glitches, full memory cards, and more, but were able to capture all of the interviews in one format or another. We had a blast, and the speakers we interviewed provided such wonderful information. What had been pitched as a series of short five minute interviews grew into in-depth discussions about a variety of topics, from the agent/client relationship to intellectual property and copyright laws. Some are offered in multiple formats others are audio only but what is said is priceless – insights into the publishing industry from those who are at the forefront. The interviews allowed those who attended to gain even more from the speakers and allowed those who couldn’t make it or had never attended the MWG Conference a chance to see what it is all about. If you are interested in the 2013 Missouri Writers Guild Conference, here are the links for more information. Thank you for stopping by The Writers' Lens - we look forward to bringing more great insights in 2013! Good Evening Ladies and Gentlemen. A special word to you who were arrested by your local law enforcement body for speeding home to read this blog entry. Despite having many favors owed to me, I am deeply sorry that there is nothing I can do for you in this regards, except to recommend a few good lawyers and remind you that this is the age of the internet. The posting will be up as long as the website is up. In light of what has happened between my last post and this posting in Connecticut, I am going to forestall my normal macabre Hitchcock opening. Because of opportunity, I am also going to interrupt our normal discussion on Writing Hitchcockian and discuss a movie that I recommend that you should go see. Please obey the traffic laws while you hurry to make the next showing of Hitchcock. The poster art copyright is believed to belong to the distributor of the film, the publisher of the film or the graphic artist. 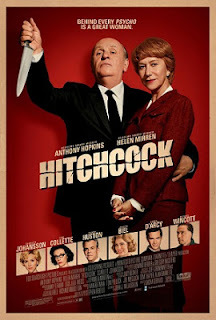 If you haven’t had a chance, but you are following the discussion the Writer’s Lens has been having on Alfred Hitchcock, I would recommend that you see the movie Hitchcock starring Anthony Hopkins and Hellen Mirren. There are many reviews on this movie by critics and Hitchcock fans. Some are positive and some are negative. If you want a review from a movie critic’s point of view, please see a blog or article written by a critic. As close to a movie critic’s statement that this article will come is: I saw it twice in the theater, which I rarely do to a movie any more these days, and I intend to make the movie a part of my DVD collection. The movie is being slowly released in a limited viewing—not unlike the original release of Psycho. At the end of this article, I will put a link to the movie site so that you can see where and when it may be released in your area. What I would like to do instead is discuss in this article how the movie on Hitchcock and his making of Psycho shows the creative process of the Master of Suspense, of the doubts and obsessions that go through us writers and creative people, and the determination despite the critics and naysayers. The movie opens and closes in a traditional “Hitchcock Presents” style. The opening shows a scene where Ed Gein, the real life inspiration behind the book and the movie Psycho, kills his brother. Ed Gein becomes a character through out the movie as an expression of Alfred Hitchcock’s darker side—or rather as we have discussed how Hitchcock used Freudian psychology in his movies and story world—his Id. We see how the “psychological character” of Ed Gein twists Hitchcock’s self doubt in his ability and in his marriage to Alma Reville—perhaps his greatest supporter in his life. The world of the mind (the Freudian Super Ego). It also shows how he marketed the movie when Paramount didn’t want to spend the money to do it. Psycho was a movie Hitchcock had to produce himself. The movie industry was not enthusiastic about it and the censors at the time threatened to stop its release. Alfred and Alma put up their mansion up for mortgage to pay for the movie to be made. I do not want to go into everything in the movie as I have already given too many spoilers here—but not enough to ruin the movie. If you are a writer, regardless of your genre, I would say this movie needs to be on your must see list. I can promise you, if you have gone through any trials or tribulations in your writing, you will relate. You may even see the shadowed profile of Alfred Hitchcock himself on the wall in the mirror of your mind. For how this all plays out, for how the story conflicts are resolved and how the story worlds collide—well, I am no master of suspense, but I think I will leave you stewing in your curiosity. For information on Ed Gein: http://www.whowasedgein.com/ You will find what he did to be disgusting, but I also bet you will keep looking. Hitchcock made the same bet. 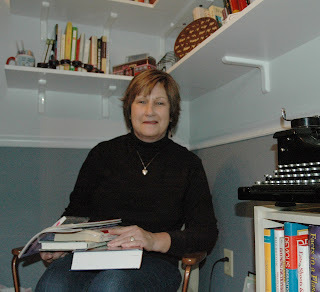 On Friday, I posted my normal article about a book from the Crime Writer’s Library. Little did I know at the time that the United States would be gripped with the shock at another senseless mass murder. I had expected to write my Monday article on the business of writing and I was going to address the ideas behind the author’s website. I am going to take that idea and hold onto it for the future. Instead, I am going to write on the purpose of writing. It took me quite a while to get my emotions under control to write this article. I know I can seem hard, cold, and callused regarding death. I have seen so much of it in my lifetime that often I feel that I walk in Azrael’s shadow. I have seen the dark side of humanity, looked it in to the eye and have seen the gleam of evil that I would hope none who read this article would ever know. Perhaps this is why I write about such dark subjects, because in my writing my emotions come forth. Despite the ragged edge of life with which I have walked, my humanity cannot help but be affected by such events. There are many debates going on our society in the aftermath. This article is not going to address those debates and any comment for or against on those debates will be deleted. However, as writers the tragedies and society that we see are our business. If you are writing sugary poetry and stories where the world is beautiful and you do not touch on social issues, you are failing yourself and your readers—if have any. It is our job to address social issues and to weave them into our stories. It is impossible to be a writer and not side one way or another on any of the issues we see in our world. Writing about social issues is not restricted to genre nor is it restricted to the age of our reader. Genre and audience only dictate how you do it. The amount of social issues that can be addressed are unlimited and can be scary to write about. We may feel that we will lose our audience when we address a certain issue or take up an unpopular stance against the social norm. Tough fruitcake. That’s our job. That’s what your readers expect from you and from me. What are the social issues you have addressed in your current work in progress? Have you brought the ugly side of them to the surface or is it lying in the undercurrent like crocodiles waiting to pull the reader under? Have you flushed it out enough? Ask yourself these questions with each draft of your poetry, song lyric, novel, or short story you write. Ageism / Old Age etc. Neither of these lists are exhaustive. If you are writing, you are passionate. If your writing is flat, ask yourself “what social issue is in my writing and have I explored it enough?” I bet your answer will be that you haven’t.